Pedal Power is a 3D racing/kart game I made during my internship at VirtuaGym. It has actually nothing to do with KeeWeed, except that I worked on it for 5 months. 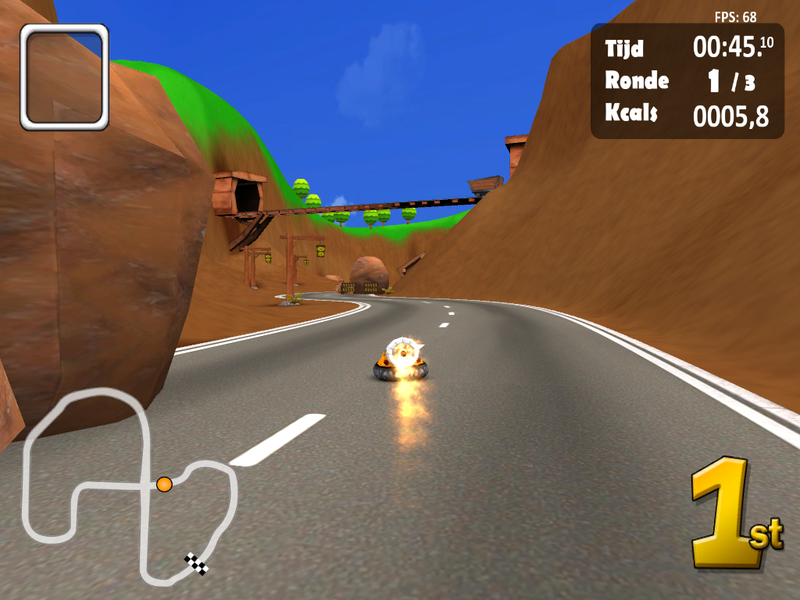 It was made with Unity3D, using C#, and the graphics and main design are from Bas Kersten. The game is aimed to be played in gyms/fitness centres, on a special hometrainer that sends the motion of the pedals and steer to the computer. Still, the game is also playable using a normal keyboard and great fun when played over a network! Especially the loose physics provide a nice change from games like Mario Kart. Awesome, did it work? How did you like it? Really fun game to just sit back and enjoy with your friends at class after finishing any work you have. Is it still being worked on or is it already complete? Hehe, that sounds like a great use-case of the game 😉 I’m not working on it anymore for a long time now. This is a wonderfull game. Clear, simple and really fun in LAN. Is it possible to run two parallel games in one single lan (for a group of more than 8 people). Like: 8 people in one game and when the game startet, the other people can create and join another game. Thanks for your comment! I think that’s possible. Simplicity of setting up a LAN-game was our priority here (over the possibility of creating multiple games), but I guess that when the game is running, you can hit the multiplayer button and it will create a new ‘room’ which can be joined by others. This game is so nice! I just wonder if there is a way o jump right into the game instead having to confirm the screen resolution and stuff every time. Thank you for such a nice game! Hi Helio, thanks for your comment! Glad you like it. Unfortunately there is no such option. But I think it saves your last options, so you can just hit ‘launch’. That’s a shame! The game is using something called udp broadcasting and your router/switch might not support it (or block it). Maybe you can investigate that?Furthermore, every pc should have a local copy of the game folder and run it from there. Also I haven’t tested the game on Windows 8.1, so that might be the cause as well. You might want to search for “udp broadcasting windows 8.1”. Also make sure the network is a “home” network and pc’s are allowed to find each other. Best of luck, I hope you can fix it! Hello. Pedal power is rally a great racing game. I play this game everyday. But it would be very stronger if you could make other maps and other weapons. If you add these extra things i will download the new version for sure. Thanks Aryan! The people from Virtua Gym are working on it! how to create new map in this game? Like map editor, please give tools for map editor. so that game will be develope. Excellent game. Very nice graphics and has LAN mode, how is this possible? I will try to find time again and finish this game finally. And then I hope I hope I hope I can put it on-line, but the company I made it for isn’t sure about that yet. It looks great and remember me to F-Zero or Mario Kart. Good luck, and remember, my spanish web/community of freeware and abandonware game will review your games when you finish them 🙂 .